Above the south (main) entrance is a famous twelfth century Norman tympanum. This has a basso-relievo representation of a figure (probably Christ in Majesty) seated on a throne, the right hand raised in blessing and the left resting on a closed book supported on the thigh, within an oval compartment; on each side is a winged figure kneeling on one knee, supporting the medallion. It is tempting to think that this tympanum helped inspire John Mason to write How Shall I Sing that Majesty. The form of Christ in Majesty supported by angels came to England from Burgundy and its earliest surviving appearance in this country may be on the Prior’s doorway at Ely Cathedral in the 1120s. As this has compositional similarities to Water Stratford our doorway cannot be significantly later (a 1958 suggestion dated it at around 1150). The semi-circular arch of this doorway is richly zig-zagged, and supported by two low pillars with sculptured capitals; and along the head of the doorway, underneath the basso-relievo, is a border of small intersecting arcade work, delicately carved. This entrance was at one time approached through a small porch, which must have been a practical feature, though an architectural sin against the fine arch and tympanum. left on the occasion of a wedding in 2005. Note the cold damp appearance of the walls, now much improved by the 2009 redecoration, as can be seen in the photo of the chancel arch below. The south wall has one window of coloured glass (right). 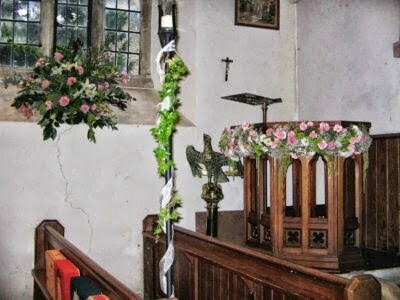 On the north wall are two plain glass windows (the more easterly one is visible in the photos of the pulpit and chancel arch) and between them are the village war memorial and the memorial to Mary Franckyshe (1629) from her husband, John Franckyshe, then Lord of Water Stratford Manor – do read the poignant inscription. The stencilled decoration around this window is typically Victorian; there was once more decoration of this kind in the chancel but it was painted over many years ago. The altar is a simple table. It is recorded that in 1522 there were two altars: a high altar and one dedicated to the Blessed Virgin Mary, the latter presumably being lost at the Reformation, though it is hard to imagine where a second altar could have been placed in such a small chancel. The deal choir stalls are 19th century, probably from the same date as the pews and the pulpit. The south one covers the gravestone of Benjamin Heart, Rector from 1720 to 1732. The tower dates from around 1350, though its height was reduced at some unknown date. Its ground floor is mercifully hidden from the nave by heavy curtains within an arch which appears to have been slightly narrowed from its original form. The area is very small and has to serve too many different purposes to be anything other than a mess. It is the vestry, a storage room and, on occasions, a 'kitchen' and a ringing chamber. It contains a small door to the tower stairway and the church's west window, which is very similar to the south window above, with their glass appearing to be of the same date. The spiral stairway is not for the faint-hearted, consisting of very narrow and worn steps which lead directly into the bell-chamber. This contains four very old bells: three that are all more than two feet in diameter at their mouths, and a Sanctus bell. The treble (G, 26.25 inches) is inscribed Marye Cornewell 1594, by Bartholomew Atton and the second (F#, 27.25 inches) Pro Carolo Newsham hanc resono musam 1669, by Richard Keene. The tenor (E, 30.5 inches) originated in 1632, was recast in 1717 and 1925 and bears the inscription Mary Cornwell gave mee 1632. New cast by H. Bagley 1717, Isaac Rushworth, rector, George Crow, C.W. (churchwarden). The Sanctus bell (13.75 inches) is inscribed E. Hemins fecit 1736, William Fillpott, C.W., and sadly this is the only bell we can ring at present. We do have a Bell Fund but it needs to be many times larger before we can contemplate the restoration necessary for the large bells to sound once more. We have yet to discover who Mary Cornwell was, or her reason for giving us bells. In 1669, Charles Newsham (1633-1705) was Lord of the Manor of Chadshunt, near Kineton in Warwickshire, and at first sight he does not at appear to have any connection with us. However, Chadshunt church contains four bells founded by Richard Keene in that same year, so it seems likely that our bell was intended for Chadshunt, proved unsuitable, and was given to us instead. Bartholomew Atton was a bell founder in Buckingham who also made a bell for each of nearby Tingewick and Mixbury churches. Richard Keene, Henry Bagley and Edward Hemins were bell founders from Woodstock, Witney and Bicester respectively, all in Oxfordshire. In 1996 the Buckinghamshire Family History Society recorded the inscriptions and locations of all the graves, and the index to this survey by surname is on this site. We try to manage the churchyard for wildlife and wild flowers so please do not expect to see manicured lawns! A visitor once counted thirty-five different plant species just outside the church door. It is a magical place in spring: aconites and snowdrops are succeeded by hosts of wild daffodils, then come the primroses, bluebells and celandines. As the adjacent slides show, cow parsley then tends to take over, which looks magnificent when in flower together with the may blossom, but smothers anything growing beneath it. Some years the mown area throws up a fine display of orange hawkbit, also known as fox-and-cubs and grim-the-collier. The trees include limes, horse chestnuts, hollies, hawthorns and yews, and on the northern edge of the churchyard stands a magnificent hornbeam, considered by local experts to be one of the finest specimens in North Bucks: Joseph Bosworth and his second wife are buried beneath it. As its girth suggests that it is between 100 and 200 years old, it may well have been planted to commemorate the death of Anne Margaret Bosworth in 1863 or Joseph himself in 1876. A yet mightier tree stands nearby in the grounds of the rectory: an oak which dates back to the sixteenth century.